Never Shot Film Before? Here’s Your Beginners Guide To Film Photography And Shooting Film. Never shot film before and want to know more? Shooting on film can be pretty confusing at first. There are a bunch of new things to take into consideration and working these out can feel pretty tricky at first. Don’t worry, in time lots of these things become second nature. For now, this page should help you get to grips with some of the essentials. So, here goes, a beginners guide to film photography. Unless you’ve already got your hands on a film camera, deciding which one to get, and where, is likely to be your first challenge. There are loads of second-hand film cameras around out there. Some are great, some not so. Do some research online to see what type of camera might be best for you – look at what the photographers you are interested in use. That is always a good place to start. Generally, people start with 35mm SLR or point and shoot. There are plenty of good quality inexpensive ones on the market for you to choose from. You might want to check out any local camera shops and see what they have to offer. The bonus of a shop is that you can handle the camera and speak to the seller. But you will pay more for the service. If you are planning on spending big, this route is probably best. But there are some cheaper options. The best place for second-hand cameras at affordable prices is, unsurprisingly, eBay. Obviously, we recommended that you use all the standard eBay precautions – seller rating, quality of information, etc. Other key things to look out for are signs of wear and tear on the body, and scratches and fungus on the optics. It is possible to find a really good deal on great cameras this way. Whatever you do, find yourself a camera and get shooting! Once you have got a camera, you are going to need some film. When it comes to buying film there are a few things you need to know. Film format is the size and shape of the film itself. You have to get the right one so that it will fit your camera. The most common are: 35mm (or 135), 120 (or medium format), 4×5 (large format). Now there are more, but for starters, this is all you need to know. We would recommend starting with 35mm film – is quick and easy to load, you get the most shots for your money. The most important thing though is to know which format your camera takes so you can buy the right film. You can read more about 35mm, 120 and 4×5 in our Guide To Film Formats. Film speed, also known as ISO, is the sensitivity rating of the film. This is much more important with film than it is digital cameras. A films speed will determine its sensitivity to light – low ISO number will basically need more light to get the right exposure than a high ISO number, which will need less. There are a whole bunch of reasons why you might choose different speed films, but to start with we recommend a 400 ISO film. This is about the middle of the sensitivity scale and is probably the easiest place to start. You can read more about ISO in our Guide To Film Speed. And of course, you also have to choose colour or black and white! Now you know what format film to buy. And have a better understanding of what ISO means, we get to the most important part of any guide to film photography. You need to choose your film. Whether you choose to start with black and white film or colour film is up to you. It can be fun to experiment with both when you’re starting out. If you want to shoot colour film we would always recommend starting off with Kodak Colorplus 200. It’s really affordable, the cheapest film we sell. You get great results for the price and it will give you the freedom to make mistakes when you’re starting out. You can find out what we think of it in our Kodak Colorplus Film Reviews. As a first choice for a black and white film, Kentmere 400 is a good pick. It has a good tonal range and latitude. Which means you will get good results while you’re learning. Also, this is one of most affordable black and white films sell. Of course there are loads of options available once you get started. 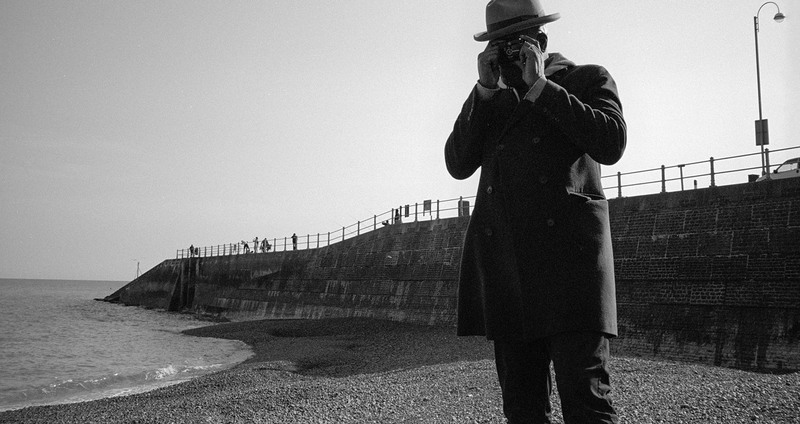 You will want to shoot the black and white classics Ilford HP5 400 and Kodak Tri-X 400. When shooting colour Fuji Superia 400 is a really popular choice and great all rounder. And you will also want to try the professionals favourite, Kodak Portra. Good things take time and shooting on film is no different. Once you have shot your film you are going to need to get your film developed. You can either take it to a lab or do it yourself. There are mini-labs which will process your film. These tend to be quick, but they aren’t the cheapest, nor the most reliable. But, if it is your only option, it will do the job. Professional darkrooms/labs are a better choice. They tend to have more experience and they are worth seeking out. If you really want to learn about film, the best thing to do is learn to develop it yourself. Understanding how to process will teach you a lot more about photography. Follow the links to find out How To Develop Black and White Film and How To Develop Colour Film. These are simple step by step guides that show you that developing your own film is easier than you think. As well as being a lot of fun. One of the fun things about photography is there is always more to learn. Now this guide to film photography has got you started, you can find out more about different techniques. Our guides to aperture and shutter speeds will help find out more about how to control your analogue camera. If you need some help deciding which film to choose next then check out our Film Reviews. You can also see what our customers are shooting on our This Is How You Shoot Film page. Follow us on Instagram and join in!